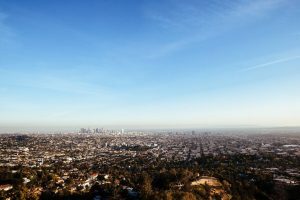 What do you do if you only have one day (or less) in Los Angeles? There are many reasons you might find yourself with such a short time to explore such a major city. Maybe you are in LA for business, or maybe you are flying into LA one day and out of LA the next. LAX is, after all, the second busiest airport in the US and has non-stop flights to 34 different countries. I was in LA as an extended layover of sorts before making my way to my final destination of Hawaii. 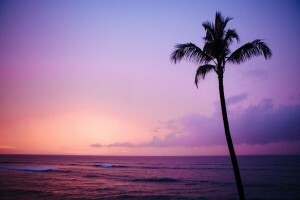 I wanted to fly Hawaiian Airlines, which does not fly out of my home town of Pittsburgh, PA. I used a free Southwest flight to get between Pittsburgh and LAX and then purchased a direct flight from LA to Hawaii, much cheaper than flying all the way from Pittsburgh. Breaking up the trip also made both the flight time and the jet lag more bearable. Regardless of how or why you find yourself in LA, it’s hard to figure out where to start when you only have a short amount of time to explore. If you only have one day or less then I’ll recommend that you check out the Venice Beach and Santa Monica Pier areas. 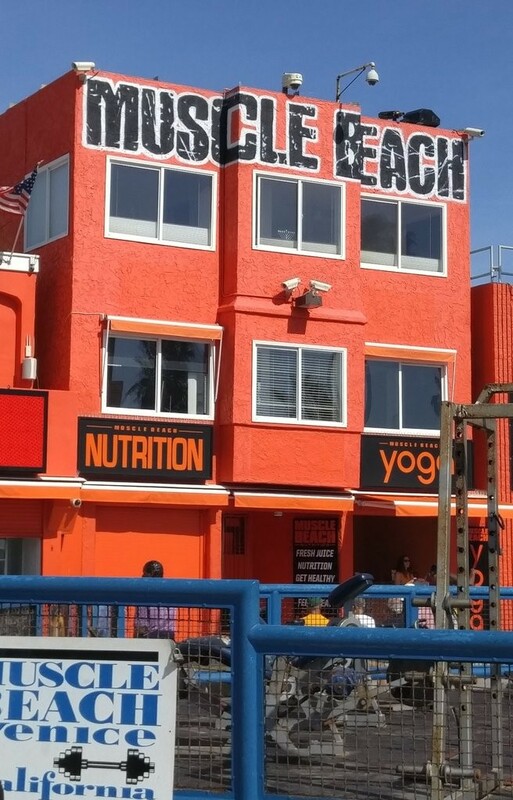 If you are staying in the area and don’t have a rental car then you’ll want to call an Uber and ask them to drop you off at Muscle Beach. Watch some of the jacked guys working out (or get a quick workout in yourself) at the outdoor gym, or on the beach pull-up bars, rings, and rope climbs. Walk down to the beach and stick your toes in the beautiful Pacific Ocean then walk back across the sand to the boardwalk. As you walk down the boardwalk there are plenty of shops to pop into if you are interested in buying any souvenirs. The boardwalk is also a great place to people watch so keep your eyes peeled for some interesting characters. 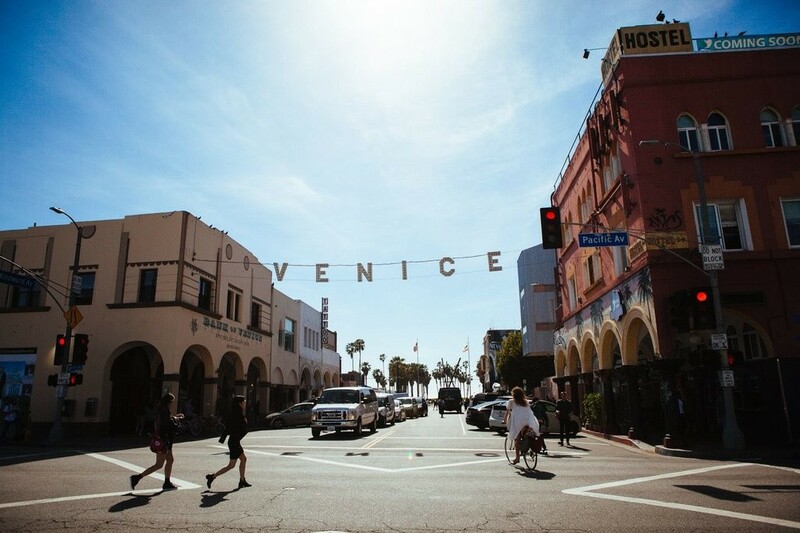 Your next stop will be the iconic Venice sign. It is hard to get a good picture of the sign from any of the street corners in front of it, but you also don’t want to ruin your vacation by standing in the middle of the road and getting hit by a car. What I did was wait on the corner until the traffic lights changed and I had the walk sign to cross parallel to the sign. I stopped quickly in the middle and snapped a couple of pictures before continuing the rest of the way across the street. Of course you’ll need to make sure you are back on the sidewalk before the lights change again. Now that you’ve gotten a picture with the famous sign it’s time to go back to the boardwalk and the beach. 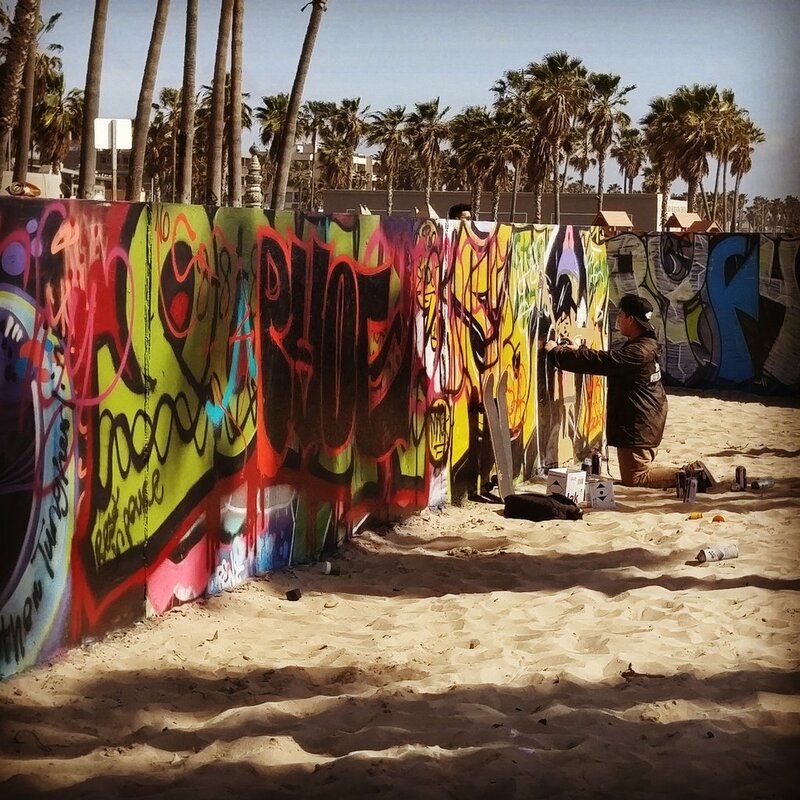 Next up you’ll see some walls on the beach that are covered with graffiti. If you are lucky you might even get to see some graffiti in progress. 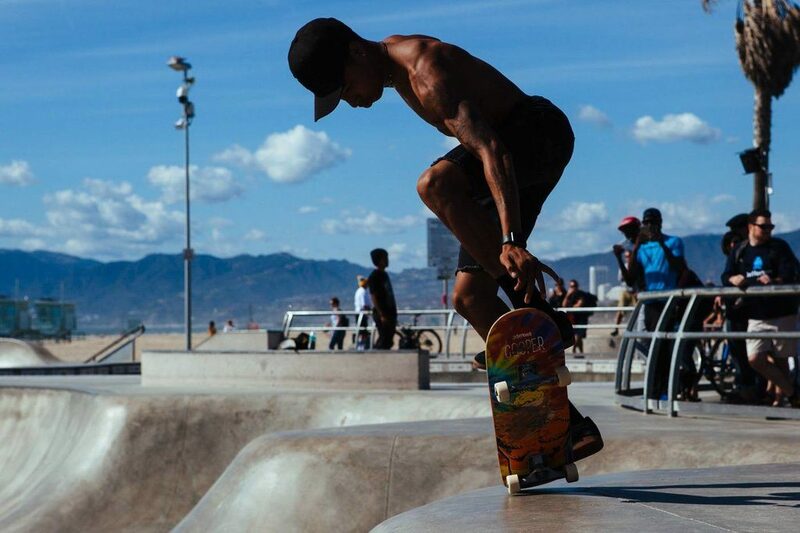 As you continue to walk down the boardwalk you’ll see a pretty cool oceanfront skatepark. My husband and I found the skatepark to be a very entertaining part of the day and we spent a lot of time watching and photographing all of the skaters. 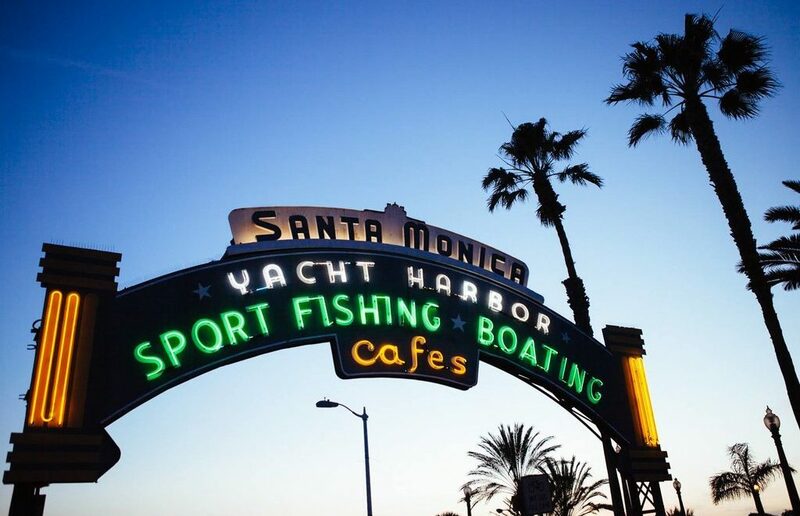 You won’t have any other specific stops before getting to the Santa Monica Pier. Depending on the time of day though you might consider stopping for lunch at this point. There are plenty of places to grab a bite to eat on the boardwalk. I’ll definitely recommend walking (or bike riding, rollerblading, etc.) the rest of the way to the Santa Monica Pier but I do want to warn you that the walk is further than it looks, despite being able to see the pier in the distance. Depending on your health, how tired you’re already feeling, the weather, and how much daylight you have left, you may want to consider taking a taxi or uber the rest of the way to the pier. You’ve made it to the last stop of the day. 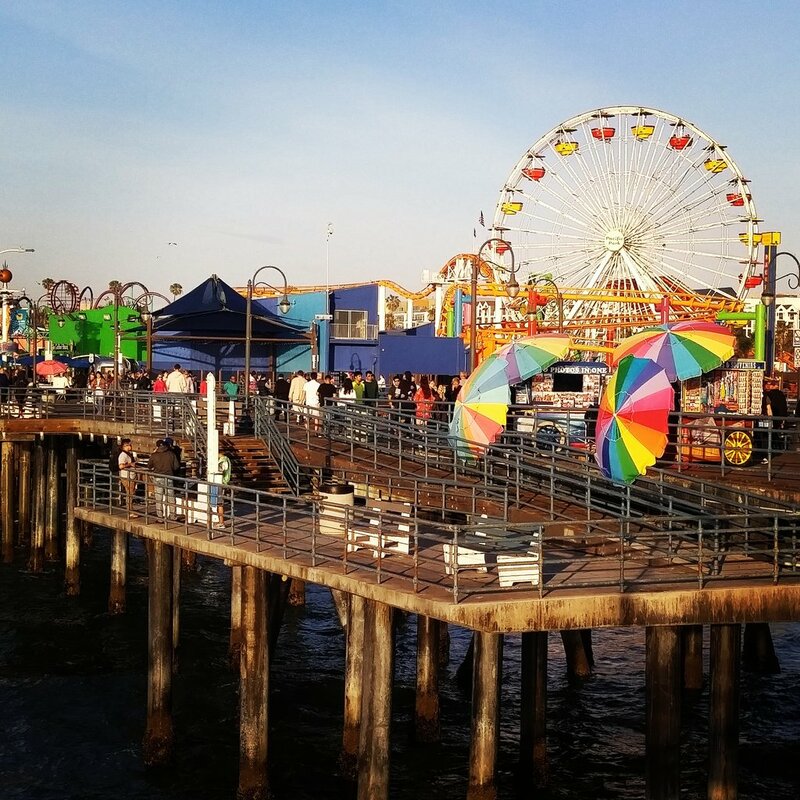 Actually, there is so much to do on the pier that you could probably make a whole day out of visiting the Santa Monica Pier alone. On the pier you’ll find an aquarium, an amusement park, an arcade, shops, and even restaurants. 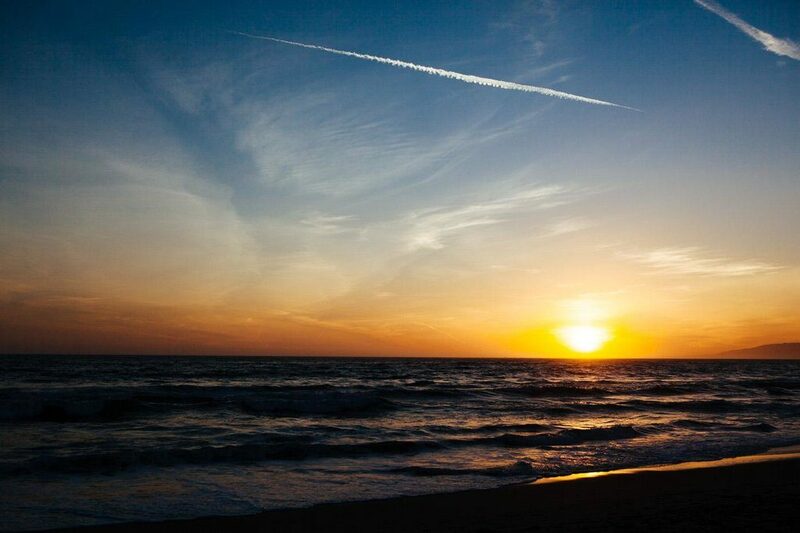 End your day with a beautiful view of the sun setting over the Pacific Ocean. There really isn’t a bad place to watch, but I’d recommend stepping off the pier onto the beach and finding a place to sit in the sand. I hope you’ve enjoyed your day in LA. 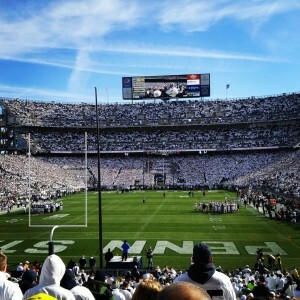 Check out our 2 day itinerary if you ever make it back to LA and have more time. 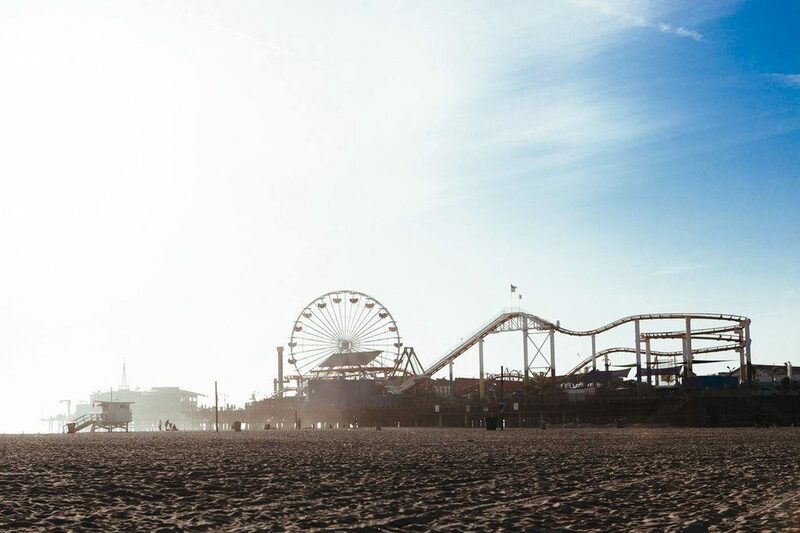 What is your favorite stop around Venice Beach and the Santa Monica Pier? Are there any attractions that we missed? Let us know in the comment section below!